Purpose: Use this document to adjust accumulated depreciation. Enter desired information into the Asset Identification field. Use the Trans Date field to display the date of the transaction for adjusting accumulated depreciation. Use the Acctg Date field to display the date of the transaction is posted to the general ledger. 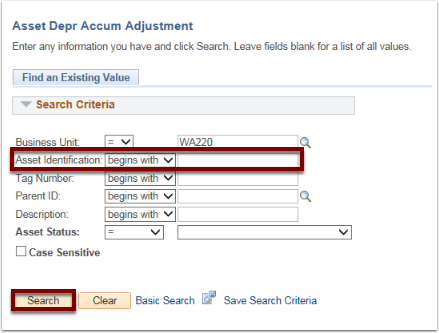 Enter an amount in the Depr Accum Adjustment field. Use the Year to Date Depr Adjust field to specify the accumulated depreciation adjustment amount. When adjusting accumulated depreciation, you need to ensure that each book is adjusted separately. View the adjustments made to the accumulated depreciation. Click the Asset Depreciation link. Use the Period Depreciation page to view the adjustments made to the accumulated depreciation.